The Tessarina is situated along Bukit Timah Road. The development, ideally located within the prestigious District 10 neighbourhood, is predominantly surrounded by landed estates and remains close-by to the 81-hectare Bukit Timah Nature Reserve. 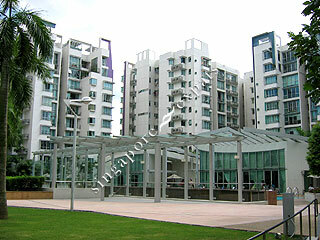 This allows residents to enjoy a tranquil environment amidst the green and serene setting of nature itself. The Tessarina is merely minutes away from the Central Business District (CBD) and the major shopping and entertainment belt along Orchard Road. Within the site's immediate vicinity are a host of preferred educational institutions from primary to university levels. For the golfing enthusiast, the development is also close to the Singapore Island Country Club and Green Fairways public course. Major bus services and taxis are easily available from the area, while access to other parts of the island is convenient via the Pan Island Expressway (PIE). Aside from the tennis courts, swimming pools, Jacuzzi and children's playground, The Tessarina features a visually dazzling clubhouse which is set against a multi-layered landscape and houses a range of country club-type facilities with state-of-the-art theatre lounge and a fully equipped gym. The Tessarina caters to the needs of home buyers as well as tenants ranging from singles to families, with a choice of unit sizes from 900 sq feet to 3,671 sq feet, comprising a good mix of two, three and four bedroom units. There are also 11 strategically located penthouses in the development featuring distinctive architecture and exceptional interior treatment. Layout squarish. Efficient use of space. Suitable for families. Renovations going on one after another since I moved here. One unit started, followed immediately by another and their renovations last for months! The units are old, are getting hacked and renovated and it is extremely noisy especially if you are at home in the daytime or have babies. Regretted moving here. Beware! Good location with good amenties nearby. Near to city too. The Tessarina is within driving distance to the numerous restaurants and eating establishments sprawled across the area. Residents can head down to Turf City shopping mall for daily necessities and more. In addition, the Swiss Club is just a stone's throw away. Condo was built in 2003 and all facilities are very good. Mgmt takes good care of the property. The koi pond and the pool are fantastic as are the tennis courts. Residents are a mix of locals and expats. It's a great community and we have loved living here. Bukit Timah hill and the old railway tracks are very close by and get weekend escapes in the city. Perfect for both expat & local.